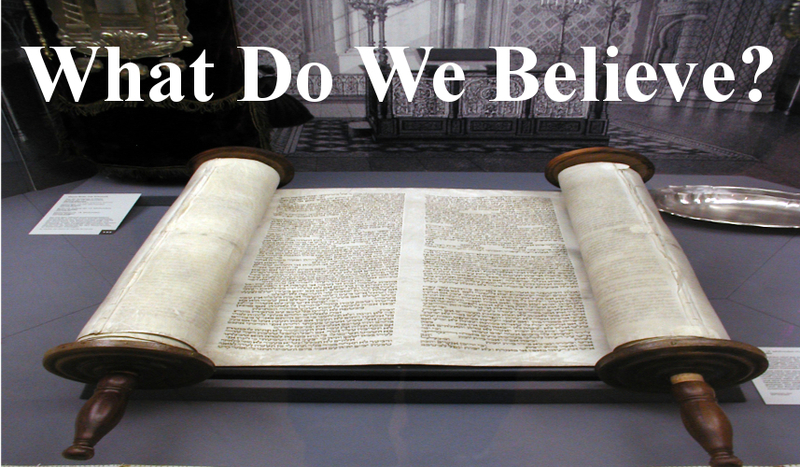 What we believe is described by what is called The Baptist Faith and Message. The Baptist Faith and Message is published by the Southern Baptist Convention and is periodically updated at the annual meeting. It must be emphasized, however, that this doctrinal statement from the SBC is descriptive, not prescriptive. It merely describes what most Southern Baptists probably believe and has no authority over them. The only authority for faith and practice for us as faculty or students at Quartz Hill School of Theology, and its supporting church, Quartz Hill Community Church, is the Bible. While some church groups have creeds, Baptists are explicitly non-creedal. The danger in any creed, statement of faith, doctrinal statement, or The Baptist Faith and Message is that all too often that creed takes the place of scripture. “Scripture alone” and “faith alone” were two important statements that came from the Reformation. We refuse to allow any human made statement to take the place of biblical authority. We believe in one God: the Father, Son, and Holy Spirit. We believe that Jesus was born of a virgin, died on the cross for our sins and rose again on the third day. We believe that Jesus will return some day. We believe we are saved by grace, through faith alone; we do not contribute in any way to our salvation. We believe all Christians should be baptized by immersion. We believe in the universal church which is expressed in local congregations. The Bible was written by divinely inspired human beings. It is the record of God's revelation of Himself to humanity. It is a perfect treasure of divine instruction. It has God for its author, salvation for its end, and truth, without any mixture of error for its matter. It reveals the principles by which God judges us; and therefore is, and will remain to the end of the world, the true center of Christian union, and the supreme standard by which all human conduct, creeds, and religious opinions should be tried. The criterion by which the Bible is to be interpreted is Jesus Christ. God the Father: God as Father reigns with providential care over His universe, His creatures, and the flow of the stream of human history according to the purposes of His grace. He is all powerful, all loving, and all wise. God is Father in truth to those who become children of God through faith in Jesus Christ. He is fatherly in His attitude toward all people. God the Son: Christ is the eternal Son of God. In his incarnation as Jesus Christ He was conceived of the Holy Spirit and born of the virgin Mary. Jesus perfectly revealed and did the will of God, taking upon Himself the demands and necessities of human nature and identifying Himself completely with mankind yet without sin. He honored the divine law by His personal obedience, and in His death on the cross He made provision for the redemption of humanity from sin. he was raised from the dead with a glorified body and appeared to His disciples as the person who was with them before His crucifixion. He ascended into heaven and is now exalted at the right hand of God where He is the One Mediator, partaking of the nature of both God and humanity, and in whose Person is effected the reconciliation between God and humanity. He will return in power and glory to judge the world and to consummate His redemptive mission. He now dwells in all believers as the living and ever present Lord. God the Holy Spirit: The Holy Spirit is the Spirit of God. The Spirit inspired holy people of old to write the Scriptures. Through illumination the Spirit enables human beings to understand truth. The Spirit exalts Christ. The Spirit convicts of sin, of righteousness and of judgment. The Spirit calls people to the Savior, and effects regeneration. The Spirit cultivates Christian character, comforts believers, and bestows the spiritual gifts by which they serve God through His church. The Spirit seals the believer until the day of final redemption. The Spirit's presence in the Christian is the assurance of God to bring the believer into the fullness of the stature of Christ. The Spirit enlightens and empowers the believer and the church in worship, evangelism, and service. Humanity was created by the special act of God, in His own image, and is the crowning work of His creation. In the beginning the human race was innocent of sin and was endowed by Their Creator with freedom of choice. By his free choice, Adam sinned against God and brought sin into the human race. Through the temptation of Satan, the human race transgressed the command of God, and fell from their original innocence; whereby their posterity inherit a nature and an environment inclined toward sin, and as soon as they are capable of moral action become transgressors and are under condemnation. Only the grace of God can bring human beings into His holy fellowship and enable human beings to fulfill the creative purpose of God. The sacredness of human personality is evident in that God created human beings in His own image, and in that Christ died for humanity; therefore, every human being possesses dignity and is worthy of respect and Christian love. Salvation involves the redemption of the whole human being, and is offered freely to all who accept Jesus Christ as Lord and Savior, who by His own blood obtained eternal redemption for the believer. In its broadest sense salvation includes regeneration, sanctification, and glorification. Regeneration, or the new birth, is a work of God's grace by which believers become a new creation in Christ Jesus. It is a change of heart caused by the Holy Spirit through conviction of sin, to which the sinner responds in repentance toward God and faith in the Lord Jesus Christ. Repentance and faith are inseparable experiences of grace. Repentance is a genuine turning from sin toward God. Faith is the acceptance of Jesus Christ and commitment of the entire personality to Him as Lord and Savior. Justification is full acquittal by God's grace of all sinners who repent and believe in Christ. Justification brings the believer into a relationship of peace and favor with God. Sanctification is the experience, beginning in regeneration, by which believers are set apart to God's purposes, and are enabled to become more Christ-like through the presence and power of the Holy Spirit dwelling in them. Spiritual growth should continue throughout the believer’s life. Glorification is the end result of salvation for eternity. Election is the gracious purpose of God, according to which He regenerates, sanctifies, and glorifies sinners. It is consistent with the free agency of human beings, and comprehends all the means in connection with the end. It is a glorious display of God's sovereign goodness, and is infinitely wise, holy, and unchangeable. It excludes boasting and promotes humility. The church is an autonomous body, operating through democratic processes under the Lordship of Jesus Christ. In such a congregation members are equally responsible. Its Scriptural officers are pastors and deacons. The first day of the week is the Lord's Day. It is a Christian institution for regular observance. It commemorates the resurrection of Christ from the dead and should be employed in exercises of worship and spiritual devotion, both public and private. The Kingdom of God includes both His general sovereignty over the universe and His particular kingship over human beings who willfully acknowledge Him as King. Particularly the Kingdom is the realm of salvation into which people enter by trustful, childlike commitment to Jesus Christ. Christians ought to pray and to labor that the Kingdom may come and God's will be done on earth. The full consummation of the Kingdom awaits the return of Jesus Christ and the end of this age. God, in His own time and in His own way, will bring the world to its appropriate end. According to His promise, Jesus Christ will return personally and visibly in glory to the earth; the dead will be raised; and Christ will judge everyone in righteousness. The unrighteous will be consigned to Hell, the place of everlasting punishment. The righteous in their resurrected and glorified bodies will receive their reward and will dwell forever in Heaven with the Lord. It is the duty and privilege of every follower of Christ and of every church of the Lord Jesus Christ to endeavor to make disciples of all nations. The new birth of a person’s spirit by God’s Holy Spirit means the birth of love for others. Missionary effort on the part of all rests thus upon a spiritual necessity of the regenerate life, and is expressly and repeatedly commanded in the teachings of Christ. It is the duty of every child of God to seek constantly to win the lost to Christ by personal effort and by all other methods in harmony with the gospel of Christ. Christ's people should, as occasion requires, organize such associations and conventions as may best secure cooperation for the great objects of the Kingdom of God. Such organizations have no authority over one another or over churches. They are voluntary and advisory bodies designed to elicit, combine, and direct the energies of our people in the most effective manner. Members of New Testament churches should cooperate with one another in carrying forward the missionary, educational, and benevolent ministries for the extension of Christ's Kingdom. Christian unity in the New Testament sense is spiritual harmony and voluntary cooperation for common ends by various groups of Christ's people. Cooperation is desirable between the various Christian denominations, when the end to be attained is itself justified, and when such cooperation involves no violation of conscience or compromise of loyalty to Christ and His Word as revealed in the New Testament. All Christians are obligated to seek to make the will of Christ supreme in their lives and in human society. Means and methods used for the improvement of society and the establishment of righteousness among human beings can be truly and permanently helpful only when they are rooted in the regeneration of the individual by the saving grace of God in Christ Jesus. The Christian should oppose, in the spirit of Christ, every form of greed, selfishness, and vice. He should work to provide for the orphaned, the needy, the aged, the helpless, and the sick. Every Christian should live out their faith and work with all people of good will in any good cause always being careful to act in the spirit of love without compromising their loyalty to Christ and His truth. It is the duty of Christians to seek peace with all people on principles of righteousness. In accordance with the spirit and teachings of Christ they should do all in their power to put an end to war. The true remedy for war is the gospel of our Lord. The supreme need of the world is the acceptance of His teachings in all the affairs of human beings and nations, and the practical application of His law of love. Your religious convictions must not be dictated by the government. Church and state should be separate. The state owes to every church protection and full freedom in the pursuit of its spiritual ends. In providing for such freedom no religious organization or denomination should be favored by the state more than others. Because government is ordained by God, it is the duty of Christians to be loyal to the government in all things not contrary to the revealed will of God. The church should not resort to the civil power to carry on its work. The gospel of Christ requires spiritual means alone to accomplish its purposes. The state has no right to impose penalties for religious opinions of any kind. The state has no right to impose taxes for the support of any form of religion. A free church in a free state is the Christian ideal, and this implies the right of free and unhindered access to God on the part of all people, and the right to form and express religious opinions without interference by the government.